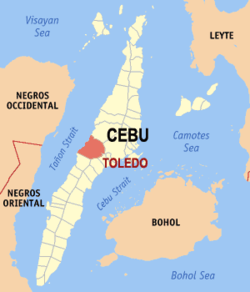 Toledo is located at the South of Cebu,an hour and a half drive from Cebu City. V-hire vans and public buses are available in modes of transportation at the City Link and South Bus Terminals. Nearest route from Cebu to Toledo is via the Naga-Uling Road.